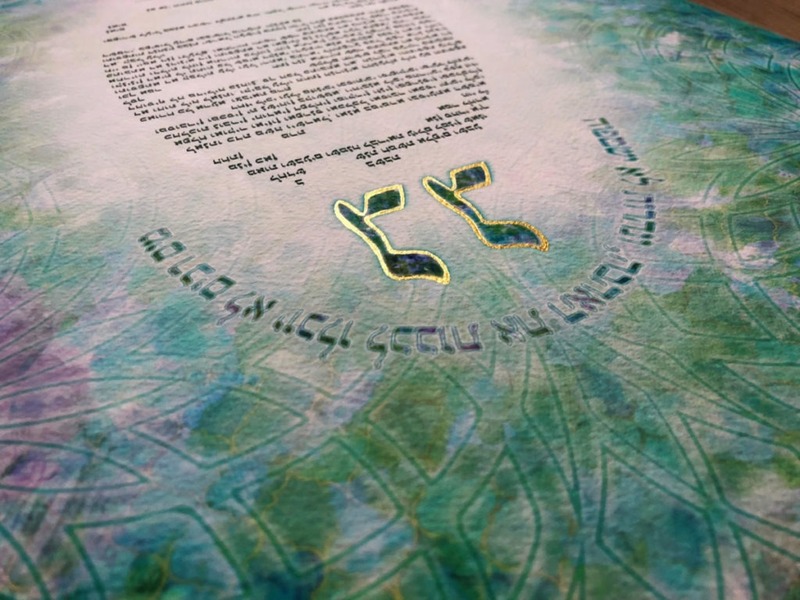 Painted with soul and love, this Ketubah expresses the unbounded, the magical and the sublime, which iterate like waves or the growth of nature expanding through and into the passage of life, and into eternity. 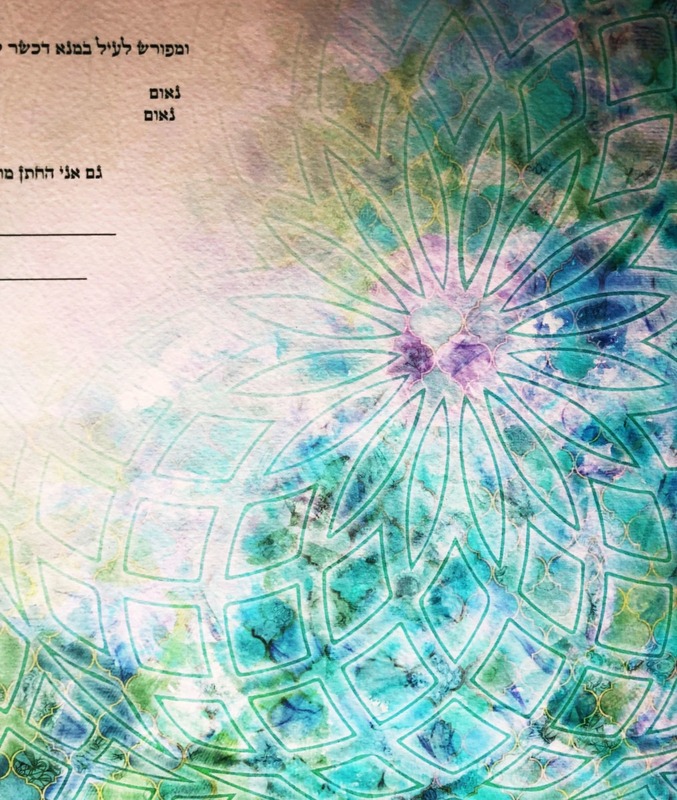 A sacred geometry inspired veil expands into the unified field of this Ketubah – a sublime passage through time and space, into eternity. 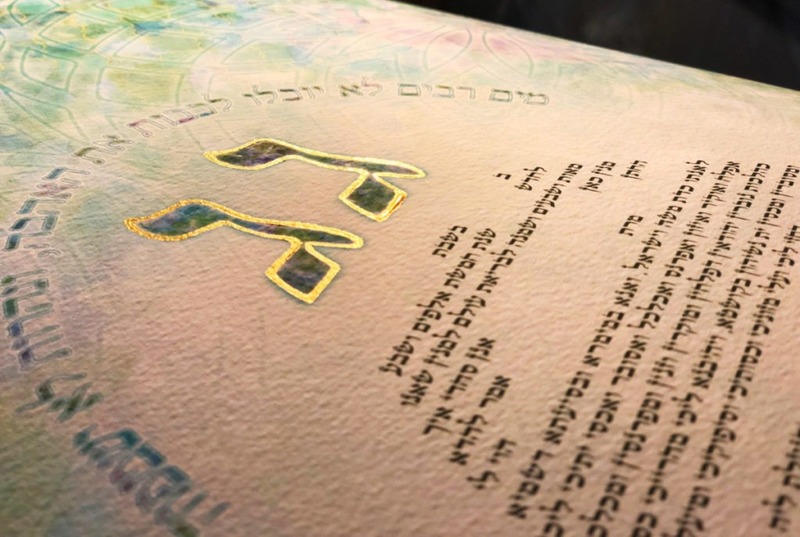 The Ketubah is comprised of a union of five components, which themselves reference the five dimensions and that the Ketubah itself is bounded by; length, breadth, width and time, but then extends into some other mystical space. 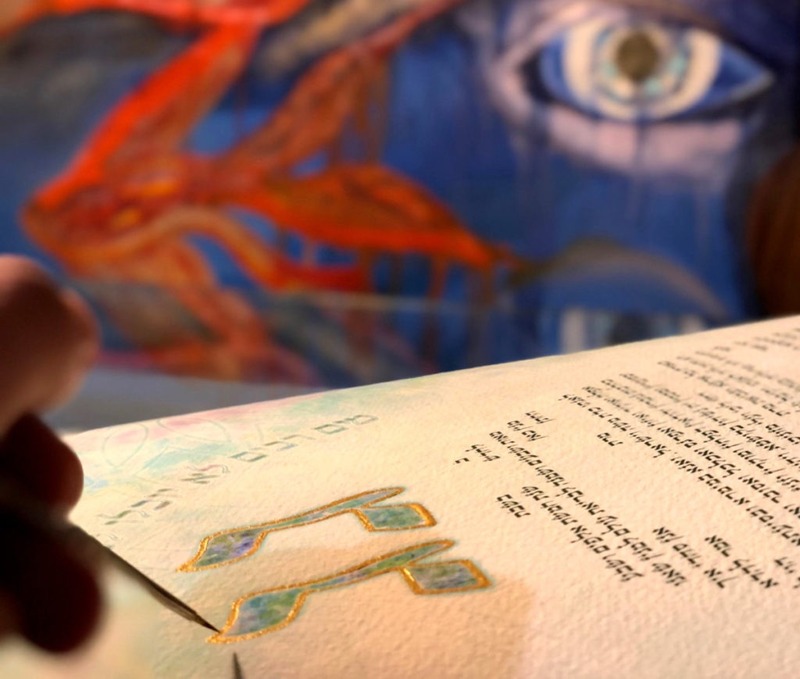 These elements include a Mediterranean mosaic tiled lattice, a watercolour stained background, a psychedelic sacred geometry veil, the initials framed by a psalm and lastly the text itself. 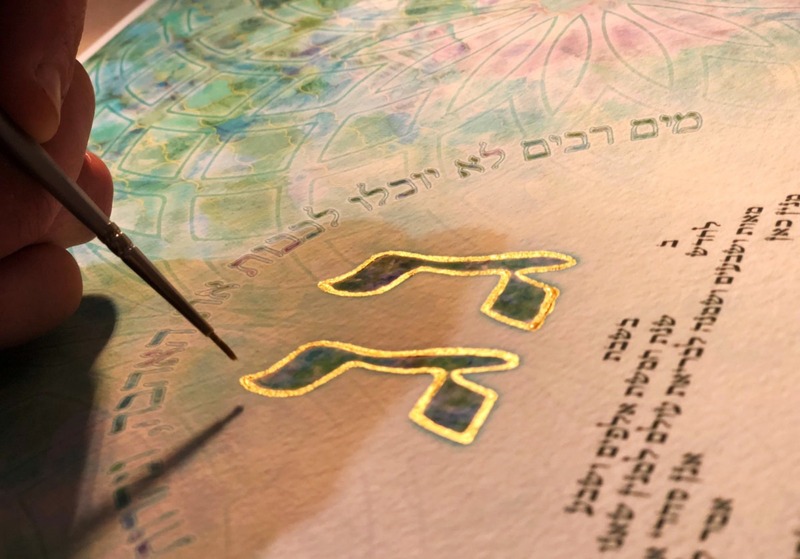 A sacred geometry inspired veil expands into the space of the Ketubah and gently floats like the surface of water. The architecture informing this design positions four lotus like Mandelas to represent the four elements; earth, air, fire and water. These give expression to the supernatural, magical and mystical spheres of the love shared by the couple. Echoing a psychedelic journey into a kaleidoscopic realm, this soft web visualizes the unbounded and expansiveness transformative experience of their being together. 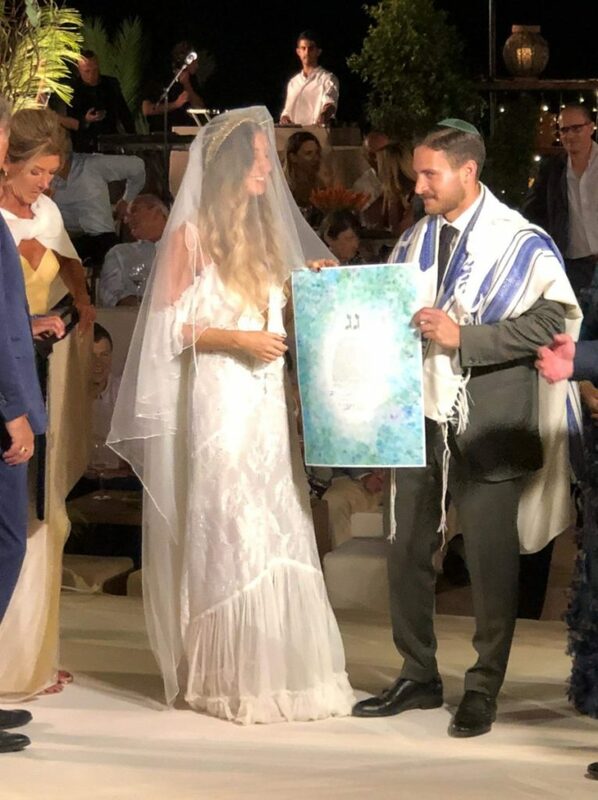 Heralding the vitality and life force of nature, a colour palette taken from the earth, forests, sky and sea overlay the Ketubah in a veiled blanket. 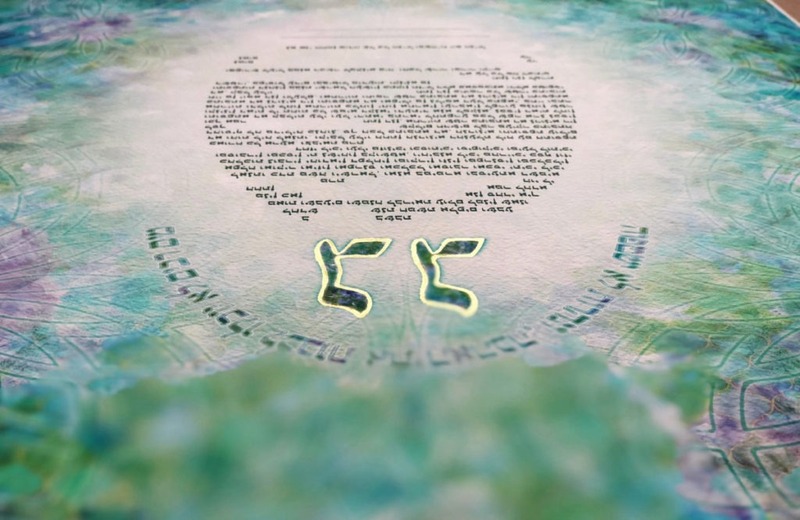 This tissue is diffused into the aesthetic of the Ketubah, which perpetuates the motif of life and regeneration through the visual dialogue evoked. 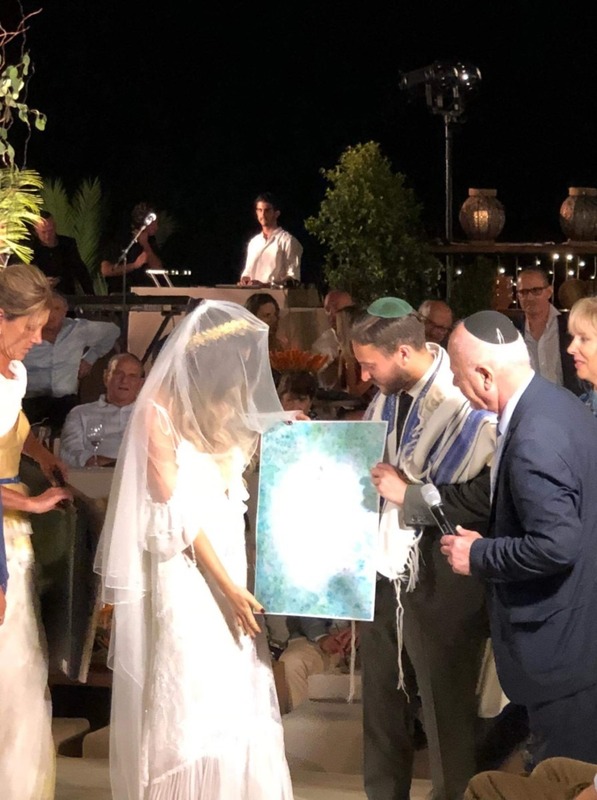 The blue mosaic Mediterranean tiled background celebrates the heritage of Eretz Yisrael as the Jewish Homeland and significance of Israel to Judaism and this love story. 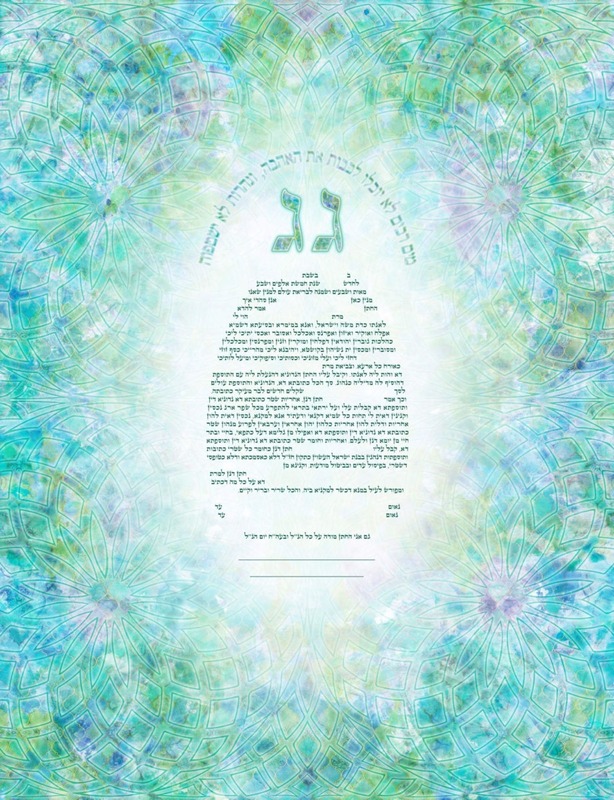 Here, the soft white cloud like layer on which the Ketubah text floats is a soft and muted contrast to the intricate details of the background, whilst still permitting visibility of its detail as it naturally fades into the background. 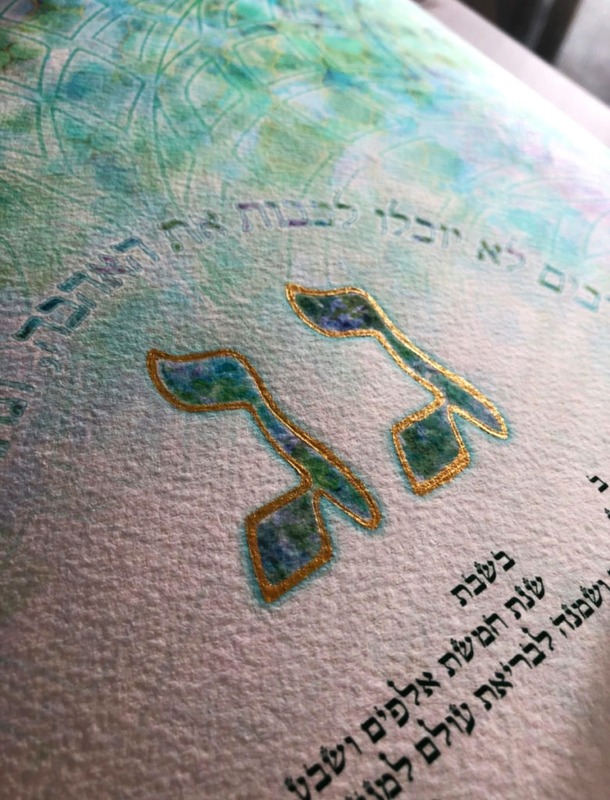 The pair of identical initials are rendered in a watercolour wash, lifted with a white glow and outlined in a gold, which radiates with a shimmering iridescence, capturing the vitality of the sun. The psalm “Many waters can not extinguish love, and rivers will not wash it” from Song of Solomon 8:7 iterates the unstoppable and unwavering force of this love and connects to the aquatic elements in the background. 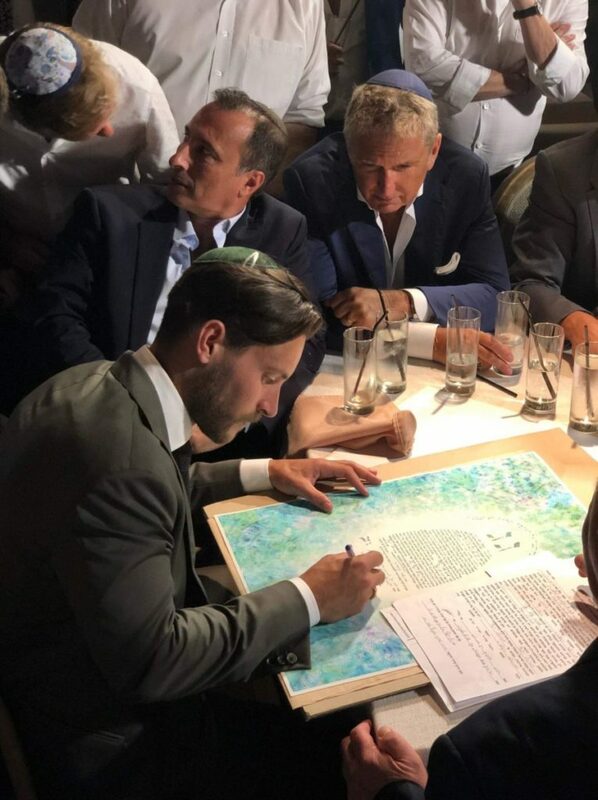 Wrapping around the initials, echoing the shape of an enclosure foreshadows the home that will be created and the union of these two souls as one.